You could sense something was different. The atmosphere was electric, it was filled with bewilderment, cluelessness, shock and fear with a bit of excitement. I was sitting with two of my friends in a coffee shop in Damascus and after saying our greetings and asking how each one was doing the logical and natural next topic was about the situation in the country. We weren't able to hide our excitement; I smiled and so did my friends. One of my friends smile didn't last long though and he asked me "how long do you think it's going to last?" At that point I didn't really think of that. The excitement that we as a people of that country have finally reached that point where we collectively had enough with it all, was all I was thinking about. I thought about the prospects of finally getting to have some of our freedoms and finally being able to call out the corrupt for the corruption that they have dragged the country into and to be able to fix it and build it was all I was thinking about. A quick thought of the question and how things were going add to that recent experiences in other countries and I said "I guess 6 more months". My friend looked at me and said "its going to take much more and we are going to suffer a lot before we get rid of this regime". Five years have passed since then and I am in a country I never thought I would have ever lived in. I've been through things like most Syrians but nothing like the pain and suffering a lot of Syrians had to go through. I left, when I didn't really want to leave but maybe (and this is what I tell myself) I wasn't destined to be there now; maybe I'm supposed to be doing something else and help in other ways that are different from what I have imagined myself doing at the beginning of it all. But I still have to figure that out. I've thought long about starting to write again on this blog, but because of personal circumstances I couldn't. I still don't think that is a good idea but I'm planning on doing it anyways. 5 years have passed and today everything I believed in before it all happened just seems right now like the biggest lie I have ever believed in. Those that I believed were righteous have turned out to be the most wicked, those that I hoped will stand by the people of Syria have turned their backs; people that I have trusted and always thought as having the highest of morals and conscious turned out to be cold and hard hearted. 5 years have passed and Syrians have divided into a thousand factions when they were two at the beginning, those that were with and those that were against. I don't believe there is a short term solution without one of the sides losing totally to the other and unless that happens more people will have sacrificed their lives and a lot more will have died for no reason. 5 years have passed, and with every heartbreaking news I hear or see I still believe that the revolution will go on and Syrians will get what they want and what they rightly deserve. Freedom, Dignity, Justice. Conformity in groups is an important aspect of human behavior. When we are in groups sometimes and most people conform to wrong decisions and outcomes just to be part of the consensus reached by that group of people even though it might be the wrong result and you knew that it was wrong. For the past two years we have seen incredible inhumane acts being carried out by people that support the Syrian regime and we kept on asking, how someone can do such horrendous acts against other people. I came across a chapter in a book written by David McRaney called “You are not so smart” which considers the psychology of the human behavior in an entertaining way. In one of the chapters it talks about conformity and how it affects us. The story above is an example of conformity. The writer asks what makes a person follow the commands of another person they have never met or have any proof that he was a figure of authority. To answer that question the author brings up an experiment that was carried out to demonstrate the effect of decision making in a group of people. In the experiment the groups were given a series of lines of differing lengths. They were asked to match the lines that were of the same length. In one group the majority were actors that were told to match lines that were obviously not the same length. One person was placed in the group to see how that person will react to the decision that group has made. In that experiment 75% of the people that at first disagreed finally caved in and went along with the decision of the group. Not only did they conform without being pressured, but when later they were questioned they seemed oblivious to their own conformity. When the experimenter told them they had made an error, them came up with excuses as to why they made mistakes instead of blaming the others. The video below shows another experiment that was conducting in 1963 examine the extent of conformity people will go to. The above video of the experiment was conducted in response to the Holocaust. The experimenter in the above video wondered if an entire nation could have its moral compass smashed, or if conformity and obedience to authority were more likely the root of so much compliance to commit unspeakable evil. 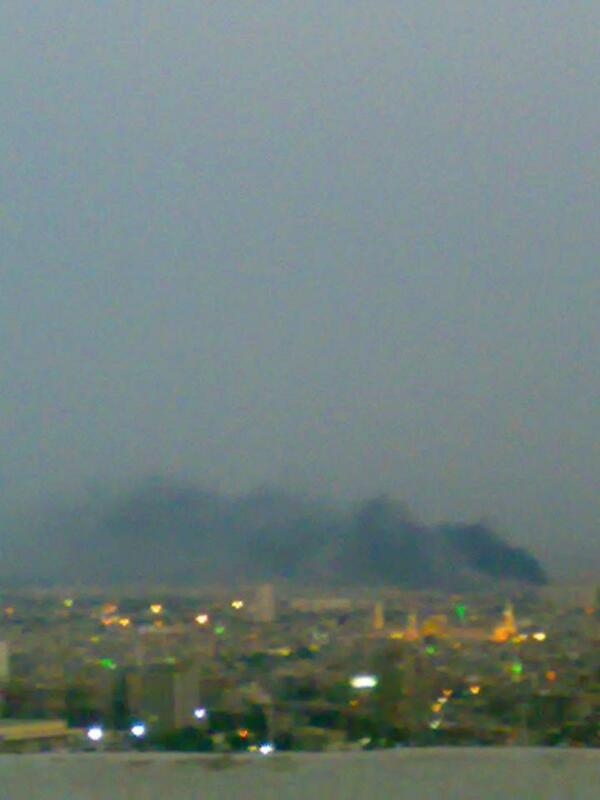 The battle of Damascus has officially started today. Last week the Free Syrian Army stated that it was ready to intensify its operations in Damascus. But that didn't spark the current situation as the FSA has been till then only defending the areas it was present in when regime thugs raided the areas or carried out other attacks. 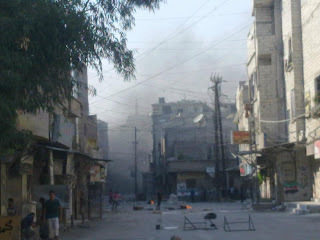 What has sparked the current confrontations between the FSA and regime thugs (Asad army and security thugs) is the attack that was carried out yesterday and the day before on the Palestinian refugee camp, Al Tadamon, martyring Palestinians and Syrians in the area. 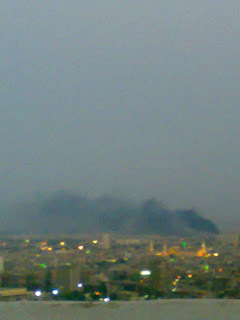 Enraged by the act and the subsequent comments made by the foreign ministry spokesman, Jihad Makdesi (an idiot who said that Palestinians are guests in Syria and that they have behaved wrongly) protests have erupted in Damascus in support of Tadamon and other areas and cities being bombarded and attacked by the regime. Predictably, the regime decided to deal with this upscale by the people of Damascus with an iron fist only to be confronted by the FSA, whom as previously stated have increased its presence in Damascus and its suburbs. A leaked document from Asad's Army General Command has given all security branches the right to use recently purchased weapons and armored vehicles where each branch sees fit to crush any protest they see. 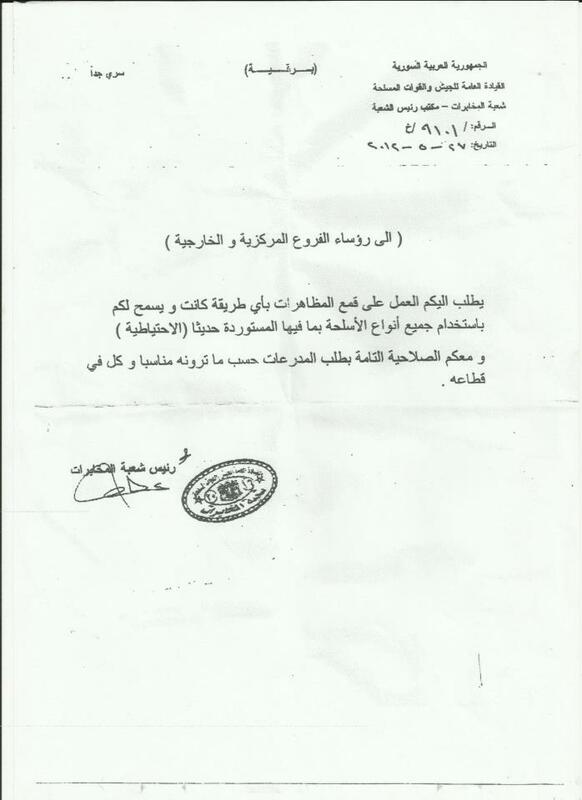 Document on the right in Arabic. 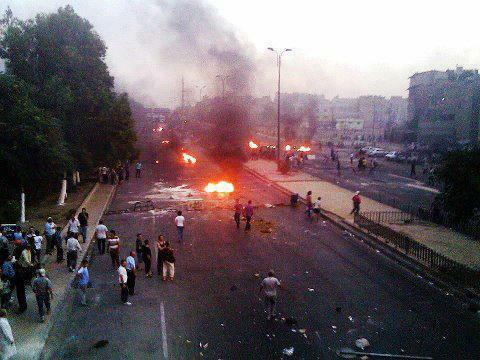 Clashes between the FSA and Asad thugs are reported in Qadam, Midan, AlQazaz, Nahr Aisheh, Sina'a, Dahadel Sayeda Zainab, Al Zahera, Yilda (Damascus Suburbs); whereas protests have erupted today in Midan, Rukn Eldeen, Baghdad Street, Aqraba, Kafr Souseh, Qoudsiya and many areas where protesters have blocked roads most importantly international road to Jordan (Deraa Highway). 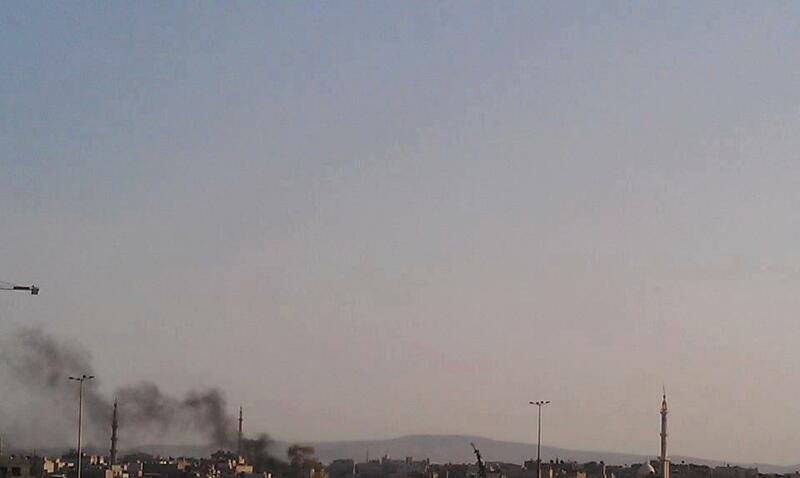 Images and videos below are from Damascus today, which show different areas where fitting between the FSA and Asads thugs are taking place. Its been a long 5 months. The last time I posted people were doubting the existence of the Free Syrian Army, there were still people that believed Asad could turn things around, Damascus was a quiet place to be, Homs still had some streets that were not destroyed and we were counting the number of martyrs everyday. 5 months later we are now counting the number of massacres, Homs is destroyed and is under siege like the siege placed by Israel on Gaza, the Free Syrian Army controls 60% of the country, and Asad and his thugs have completely lost it and have gone crazy. Yet there are still some things that remain the same. Those things that matter the most that Syrians hoped would have helped in removing this tyrant and help them in getting their deserved freedom. Arabs, muslims and the entire world remained the same. They talk, and Syrians die. It has been extremely difficult watching things from far, we try to help where we can, but nothing can be compared to the sacrifices those inside the country have made. Those brave, righteous, steadfast, simply amazing people of Syria, those that have taken to the streets to protest peacefully for change, and later on carried guns to take what is rightfully thiers, are the ones that will forever change the shape of this world. I am not exaggerating. The Russian foreign minister even said it himself, that if the Syrian regime falls there will be a new world order. This just shows the importance of this revolution. The Syrian Revolution, probably the greatest revolution against the most tyrannical, fascist regimes that ever existed will prevail. Even though the Syrian people have been left to fight out their war alone against this regime that is supported by most of the nations in this world that would rather see this regime stay than have the Syrians create something that will disrupt their plans. Abandoned by most people, abandoned by Arabs and muslims all over the world, this revolution has become an orphaned revolution. Malek Jandali a famous Syrian composer who has been a supporter of the Syrian revolution, composes this new symphony based on the song that was written and sung by the martyr Ibrahim Al Qashoush. Qashoush's famous song "Go away Bashar" was a turning point in Syrian protests as the song set a new vibrant and explosive rythm and atmosphere to the protests. This is Malek Jandali's tribute to Qashoush who will forever be remembered for his huge impact on the Syrian revolution. A beautiful voice from Hama sings for the revolution. مدونة دمعة على جثمان الحرية .